The book devotes attention to the city’s colorful past in enumerating the heyday of elaborate and grandiose hotels as well as recalling the beautiful mansions which have been lost forever. All of which are shown with undistributed photographs, complete with well researched historical data. Ellis describes the Miramar Nursing home as the most historically active site in the early days of the Pass. It was the first elaborate “Watering Hole” between the New Orleans and Mobile schooner and steamboat run. 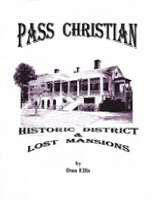 The Pass Christian Hotel was built just a few years following the construction of the Pass Lighthouse. While en route to Washington D.C. for his presidential inauguration, Gen. Zachary Taylor was celebrated at the hotel with a grand ball in his honor. It was there that the Southern Yacht Club was formed, becoming the second such club in the United States. Following the Civil War, the hotel burned down and went through a number of hotel changes, including the Magnolia Hotel which also burned down in 1915, and was replaced by the Miramar Hotel, which changed names several times afterward. The book’s, pages are filled with photographs, in color, of every home listed in the National Registry of Historic Places – which includes nearly every home on Scenic Drive. Each structure is architecturally described, including construction and renovation dates, names of builders, and listings of most former owners and/or tenants. Where known, there are many anecdotal memories recalled such as where Cole Porter stayed as a boy, the “Union Quarters,” the “Bed-Sheet Surrender”, the first automobile in the Pass, where John L. Sullivan stayed while training in the Pass for the last bare knuckle fight, presidential visits, and many more such stories. Uniquely, the book also lists names, ages, and locations for most of the Registered Live Oaks that are strewn along the scenic drive-by while viewing the mansions and cottages. Many of these homes date to the Antebellum period. Not left out, is the historic development of many of the streets as described within the pages. Besides a thumbnail historic sketch of Pass Christian, Ellis touts the pertinent organizations that promote the heritage and preservation of the Pass.